You’d be forgiven for rubbing your eyes and checking for flying pigs after seeing Fabian Cancellara pedalling through Bushy Park on a crisp December morning. But it really was the Leopard-Trek star in the flesh. Cancellara travelled to south-west London to do some secret training on the London 2012 Olympic time-trial course on Saturday morning – and Cycling Weekly was there with him. Cancellara’s entourage included his London-based Radioshack-Nissan team manager-to-be Johan Bruyneel and two members of the Swiss Olympic Committee. 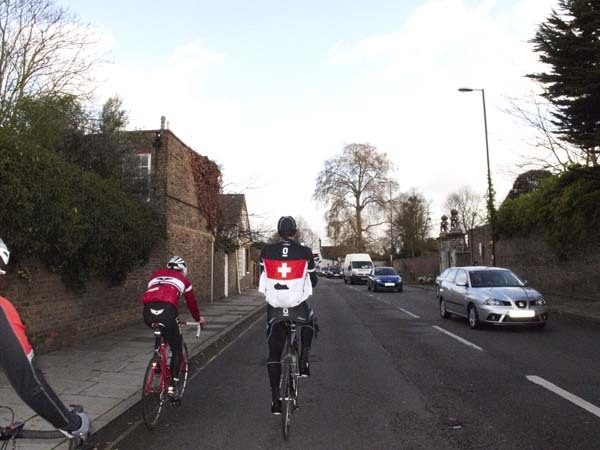 After convening at Sigma Sport’s flagship store in Hampton Wick, a few minutes pedal from the time trial start outside Hampton Court Palace, Cancellara reconnoitred the flat 44-kilometre route on which he hopes to defend his Olympic title. At London 2012, he will likely meet stiff competition from the likes of current world champion Tony Martin and Bradley Wiggins against the clock. Once he’d completed the course, Cancellara was off to Box Hill and Richmond Park to ride pivotal sections of the Olympic road race route. Surrey locals should get accustomed to cycling stars doing low-key training on the Olympic routes in the coming months: Cancellara’s surprise Saturday pedal is the first of many. For more on Fabian Cancellara’s secret training ride on the 2012 Olympic time-trial course, see the December 8 edition of Cycling Weekly.